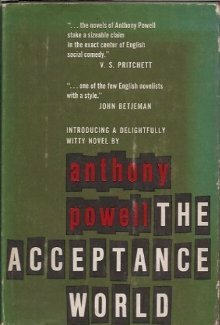 The Acceptance World, Anthony Powell, Farrar, Straus, and Cudahy, 1955, ISBN 9780434599004, 214pp. This is number three of twelve in the 12-part “A Dance to the Music of Time” series. I found the first two volumes a little dull and slow, but I am continuing to read this series mainly due to Richard Horton’s exhortations. With this book, I finally got a sense of why Richard keeps urging me along; something finally clicked. As characters reappeared, I welcomed them back as old friends, and didn’t need to flip back to find where they had entered the story before. Jenkins, the narrator, started doing something, rather than just commenting on the actions of Stringham, Templar, and Widmerpool. Marriages were consummated and broken. 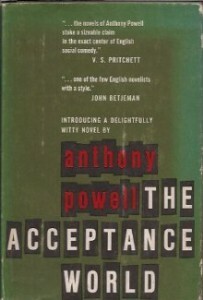 Literary and political differences moved into the foreground of the novel. For once, I even thought I saw a plot. I guess what really happened is that I warmed to both Powell’s prose and subjects. In the first two books, I thought there were occasions upon which Powell waxed poetical–loving bits of description that put both character-building and story into suspension until the subject at hand was drained of detail. I am the first to admit that I am not one fond of overt description, but one can sit still for only so long before something falls asleep. Jenkins and his contemporaries are in their late 20s in this book, which takes place in the golden years between the two World Wars. Trouble is brewing in the world, seen here in some characters who are pronounced revolutionaries, followers of Marx and Trotsky. Afterwards, that dinner in the Grill seemed to partake of the nature of a ritual feast, a rite from which the four of us emerged to take up new positions in the formal dance with which human life is concerned. At the time, its charm seemed to reside in a difference from the usual run of things…. But, in a sense, nothing in life is planned–or everything is–because in the dance every step is ultimately the corollary of the step before; the consequence of being the kind of person one chances to be. And, while I am in a quoting mood, here is a line that seemed apt: “There is, after all, no pleasure like that given by a woman who really wants to see you.” Lines like that have me anxious to continue the series.